The quiet Italian town of Lucca just north of Pisa sees an annual international convention called "Lucca Games & Comics". Comic artists, illustrators and game designers present works here and every year the "Gioco Inedito Award" is given to the best unpublished game of the year. This award includes the publication of the game sponsored by the city of Lucca. Last year's award had the theme "Cities and Walls" and the winner, "Lucca Cittá" by Alessandro Zucchini, has now been published by daVinci Editrice. Because of the theme of the award it does not come as a surprise that "Lucca Cittá" is mainly about cities and walls, or more precisely palazzos (palaces), towers and city walls. However, as with many card games this theme is only vaguely visible in this, in essence, abstract game. Players build "palazzos" by collecting cards of the same colour by selecting one of the rows of cards of an open display (there's always one more row than the number of players in the game). The player may then place them openly in front of him/her and as soon the correct amount of cards have been collected (e.g. three in a five-player game) the palazzo is completed and yields victory points. The victory points of a palazzo are determined by the number of windows printed on the cards comprising the palazzo. There are six differently coloured sets of 16 palazzo cards and a player may only build one palazzo of each colour per game. 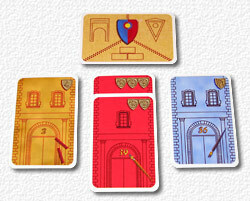 Each card besides its colour contains three types of information: a number (0 to 3) of windows, a number of shields (0 to 3, always making the sum of windows and shield equal to 3) and a street number of the palazzo. The street numbers are unique and range from 1 to 16 for the brown cards up to 81 to 96 for the blue ones and are used as tiebreaker when determining the players' sequence of a round. Palazzos yield victory points for a second time when a player decides to "open" an already completed palazzo. Opening palazzos is voluntarily and happens as the first action in a players turn. When a palazzo is opened the number of victory points is determined by the number of palazzos/cards of the same colour of the other players which are either being built or completed but not yet opened. At the end of the game victory points are awarded for "walls" and "towers" built by each player. Whenever a player takes a row of cards from the open display s/he may decide to play them as part of a palazzo (if that colour has not yet been completed) or play them face down as a wall or discard it. The catch is that walls need support at the end of the game to yield VPs (other than the towers, which are special cards in the deck). Wall support is provided by the shields of the palazzos still under construction and only if there are twice as many shields on the cards of these palazzos does every wall and tower provide an extra 2 VPs for each opened palazzo. And finally, there is a bonus/malus given to the players with the highest/lowest street number in their palazzo stack. You want to have a good selection of cards in the open display, hence you want to be first or second player in a round. However, your position is determined by the cards of the previous round forcing you to think one round ahead when selecting your card set. Another problem is the timing of palazzo completion. Here you want to complete palazzos as quickly as possible as there are not too many rounds to do so (e.g. five in a five player game). And the sooner you have completed palazzos the more options you have when opening them. On the other hand, completed palazzos do not provide support for your walls, so keeping the correct amount of palazzos unfinished is vital, too. So again timing is important as opened palazzos will not provide VPs to other players who complete their palazzo of the same colour. At the same time they will provide VPs to you depending on the number of cards and completed palazzos of the same colour of the other players, while possibly depriving you of VPs in the final calculation. 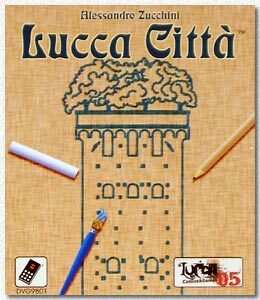 "Lucca Cittá" for me has the problem that on the one hand if you want to consider all your options to make the best possible move at any given time there is a lot of calculation and thinking ahead involved, causing the game to drag along. If you just play "as you please" using your "gut feeling" the game speed will increase considerably but so will the luck factor. Here, memories of the second game of Mr. Zucchini "Palatinus" come to mind, which suffers from a similar problem. Talking about luck: I found the element of luck a bit too high for my liking, particularly the dependency on playing order and the random card set display. And the final VP calculation of supported walls and towers plays a too big a role in the final result and the fact that if you have insufficient support for ALL your walls results in your not getting ANY VPs (not even for the supported number of walls) adds to the "being played" feeling. Played with the right group of people, either a group of brooders or a group of gamblers, the game can be fun just as well.